Canon today announced that they are releasing a follow up camera to their hugely successful FullFrame DSLR Canon EOS 5D. The new camera is called Canon EOS 5D Mark II and have some very impressive features. 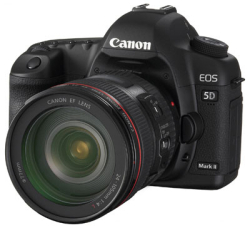 The Canon EOS 5D Mark II contains a 21 megapixel CMOS sensor, supports ISO 50-25,600 and full HD video recording. It will be interesting to see how this beat of a camera is able to compete with the new FullFrame cameras from Nikon (D700) and Sony (A900). 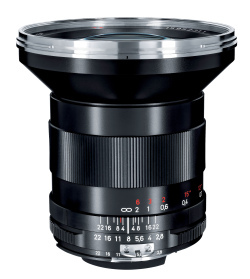 I think it is very positive that we are seeing more competition in the “economic” segment of FullFrame cameras. Maybe the prices will drop considerably in the future.. The Canon EOS 5D Mark II will be cost $ 2,699 in the US for body only. * Reduce – Internal camera mechanisms are designed to minimise dust generation. The redesigned body cap prevents dust generation through wear on the cap itself. * Repel – Anti-static technologies, including a special fluorine coating, are applied to the low-pass filter covering the front of the sensor so as not to attract dust. * Remove – A Self-Cleaning Sensor Unit uses hi-frequency vibrations to shake dust from the infrared filter for a period of approximately one second after each start up. For instant shooting after power up, this feature is disabled immediately the shutter release is depressed. * Monochrome – for black and white shooting with a range of filter effects (yellow, orange, red and green) and toning effects (sepia, blue, purple and green).